Built in 1893 by Frank M. Belding. Belding operated a general merchandise business where, according to early newspaper accounts, a customer could buy anything “from a toothpick to a threshing machine.” The Eagle post office was located in the back of the store building. Like many early pioneers, Frank Belding was first drawn to this area by the gold and silver mining boom. 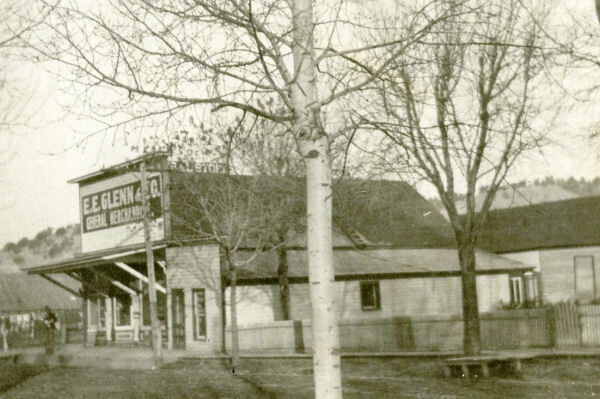 In 1887 he established a general merchandise store at Dotsero, a town ten miles west of Eagle. He served the prospectors bound for the mining camp of Carbonate. There he met a young Irish woman, Ellen O’Neill, who was operating a hotel at Dotsero. They married and moved to Eagle in 1893, where they opened the mercantile business. When Frank Belding died in 1899, Ellen, who had suffered a crippling hip injury continued to run the store while she raised her young son, Ralph. In 1902, Ellen married a miner from Fulford, Ed Glenn. 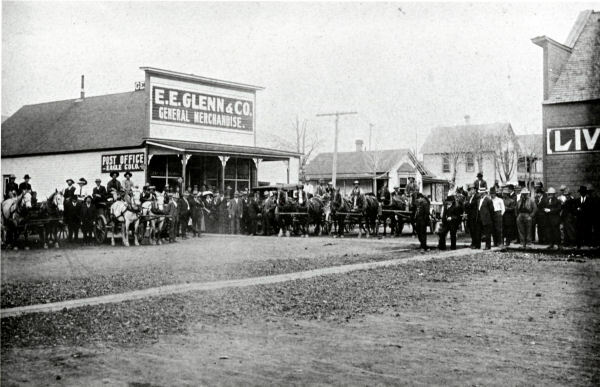 The business then became the E. E. Glenn & Co. General Merchandise store. Ed Glenn and Ellen operated the store until her death in 1935. After Ellen Glenn’s death, her son Ralph Belding, took over the business and operated “Ralph’s Store” through the next decade. Ralph also served as Eagle mayor, and was active in community groups. In the mid 1940s the Rule Electric store was located in the building space. Since that time there have been a variety of uses in the building including a clothing store, video store. The Mountain Peddler bike shop moved to the main building in 1999. The small attached portion of the building on the east side is not new. It is shown in very early photos and referred to in advertisements in editions of the Eagle Valley Enterprise as early as 1904. It was a barber shop then. It has also had many uses through the years. A storage room, barber shop and real estate office are among the uses of this portion of the building. It has also been a barber shop in the recent past.